Malia Ruskin leaves in 10 days for France as our outbound YES. She’s been studying French, and is looking forward to the next 10 months. Summer Soto and Sophia Pearson, seniors at Bishop Diego High School, spoke about what a great experience they had at RYLA. They were inspired and made new friends. Brooke Sawyer: Sandy Grasso-Boyd reminded members that they’re invited to go visit longtime Rotarian Brooke Sawyer. If you have signed up, please email Sandy and let her know when you can visit. Pro tip: He likes chocolate chip cookies. Bring in moderation. Group 8 social: The deadline to reserve your space at the Group 8 social is August 21. On Sept. 13, $45 will get you lunch, a wine tasting, a drink, and two polo matches (spectators, not participants). If you have questions, contact Diana Washburn. Weekly duties: When you are assigned a duty, please respond to Diana to confirm. If you are not able to confirm, please find a replacement and let Diana Washburn know who it is. Steve Kally won the raffle. Liz Alves won the bonus raffle of Washington wine from Tom Sheehan. Pay and Tell with Sgt at Arms David Vo. 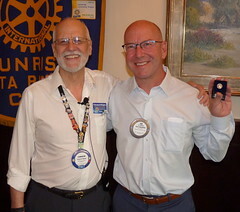 Program: Sandra O’Meara introduced Randal Avolio, president and CEO of Surgical Eye Expeditions (SEE). SEE has been headquartered in Goleta for 41 years. 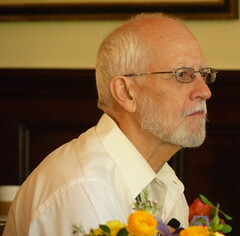 In 1992, E. Russell Smith and Luz Maria Ortiz-Smith met on a SEE International trip. Randal credits Harry Brown with the vision to see the world needed SEE. Already, 440,000 people have had their sight restored by SEE in 40 countries. He also thanked George Dovos and Sandra O’Meara. Their overhead is 2%. The team is 10-12 people. They went to Congo with 7’2″ NBA center Dikembe Mutombo from there. They estimate 800,000 blind people in Congo. SEE restores sight regardless of the patient’s ability to pay. Dr. Helena Ndume, the first ever UN Nelson Mandela Prize winner, met her husband on a SEE trip. She has done more than 30,000 sight-restoring surgeries in Namibia herself — many of them in partnership with SEE. 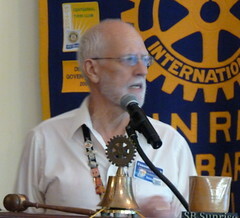 Randal told a series of inspiring stories about SEE’s activity around the world. Their activity includes the Santa Barbara Vision Care Program. It takes care of the vision needs of SB County regardless of their ability to pay. They help about 1,500 patients locally each year. They partner with the Eyeglass Factory and several Santa Barbara-based foundations. In honor of the speaker, the club will donate 15 dictionaries to local third graders in his name.